It's always a treat to get an opportunity to explore local, homegrown architecture by one of our country's leading professionals. 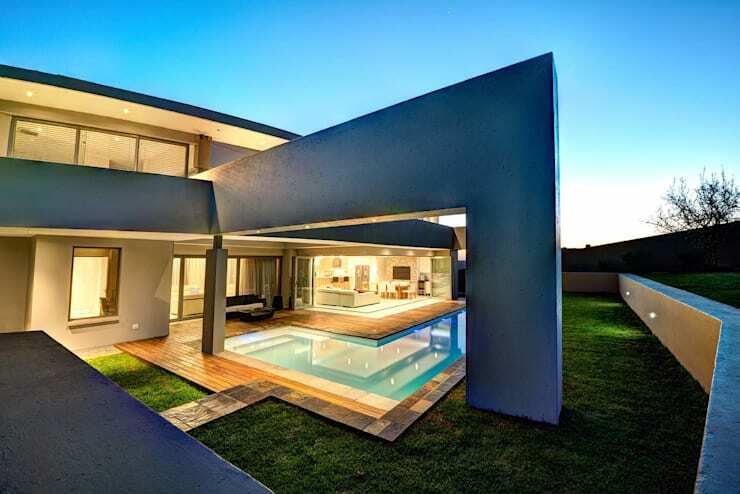 This is why today we are delighted to bring you a home, designed by Swart & Associates Architecture. Based in Pretoria, this 621.7 square metre home is inspirational and enchanting, reminding us all that our dream homes could become possibilities. 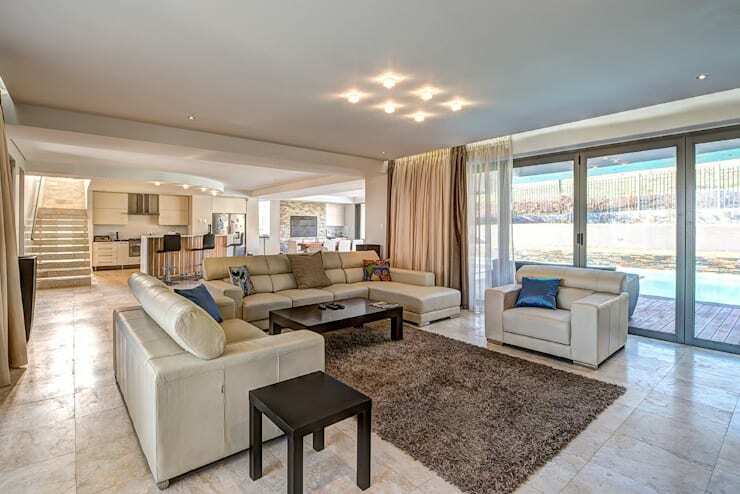 Nicknamed House Fyfe, this contemporary family home for four is based on the Waterkloof Golf Estate. As we explore it, you'll notice that concrete lines dominate the architecture, while there is a fabulous integration of interior and exterior spaces. Let's take a tour through this home and see just how beautiful it truly is. From the front of the house, we can see just how beautiful and intriguing it is. Large sandy-coloured tiles lead guests and visitors into a wide parking area, which features a double-garage and a single-garage, protected by warm, wooden doors. These garages neatly package the house, providing more than enough space for cars, bicycles and other items to be stored neatly out of sight. Pot plants have been dotted around the driveway and entrance, injecting this space with a very refreshing and natural touch. This is a great tip! White tiled stairs lead visitors up to a grand entrance, while the soft, brown tones of the facade create a very warm and inviting overall look and feel. The home is neatly packaged below a simple, flat roof. If we head around to the other side of the home, we come across a more open design where the interior living spaces spill out onto a beautiful garden, swimming pool and terrace. 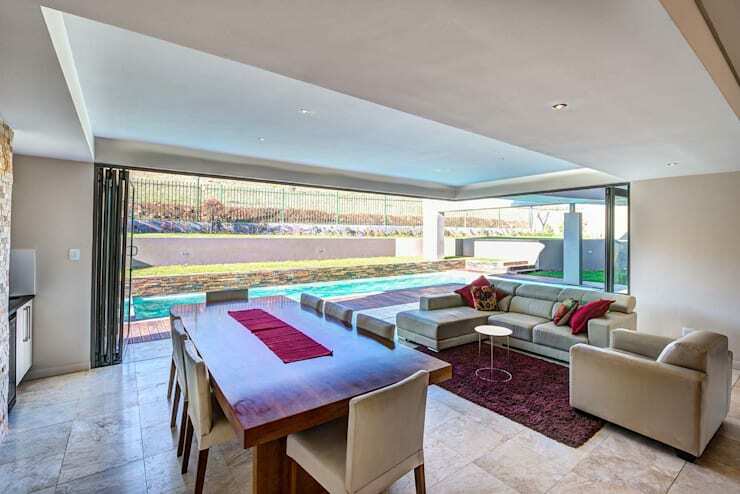 This South African home is built for the outdoor spaces to be enjoyed! The L-shaped swimming pool is very sleek and functional, contrasting beautifully with the lush green grass. A wooden terrace surrounds it, which not only looks stylish but is useful in that it is non-slip. Concrete walls and pillars create a very dynamic look and feel throughout the exterior space, while the soft, neutral tones are simply beautiful. From this angle, we can see how a thick concrete beam extends out from the home, adding a very edgy twist to the traditional facade. The strong, clean lines dominate, framing the beautiful back garden. We can also see how much of a role lighting plays, creating a beautiful ambiance throughout the exterior space. This allows the garden to be enjoyed in the evening, which is great for those warm summer nights. Have a look at these outdoor lighting ideas for modern houses for inspiration for your own home. If we head inside the home, we come across a very unique and stylish kitchen that directly contradicts the design that we've seen throughout the exterior space. While clean, straight lines dominated outside, here we come across soft curves. 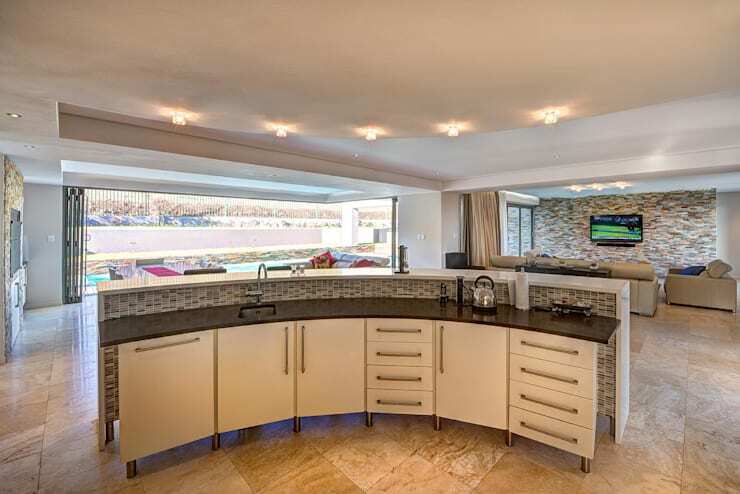 The kitchen looks out onto the exterior spaces, with a curved counter top, cupboards and drawers that allows the parents to prepare food while watching the kids while they play outside. The designers have opted for light tones in this space including beige tiles, white cupboards and drawers and black counter tops. You'll also notice that the counter tops are bare except for the most functional of items. This is a great example of how storage space has been utilised adequately, keeping the cooking area neat and tidy. It's hard to figure out if this modern living room and dining room are positioned inside or outside the house! Glass sliding doors surround this living area, which can be rolled back to give the illusion that they are one with the exterior space. This creates a very refreshing environment that is comfortable and shaded but still allows the family to enjoy the surrounding nature and fresh air. This area of the home also features neutral colours, but we can see how the cushions and table cloths add a splash of colour to the design. The rug also introduces a cosy touch! This is a more formal living room, which can be used for hosting tea parties or entertaining work colleagues. The neutral colours in this space create a very elegant and sophisticated design. We can also see how much of a role natural light still plays, however. Sunshine streams in through the large glass windows and doors, ensuring that this space is very light and bright. This also makes it feel slightly more spacious. Do you see how the open plan nature of the home creates a very social and interactive environment? This is great for a family home! Before we leave this home, we just want to pop our heads into the bathroom to show you how simple and and sleek these spaces should be. 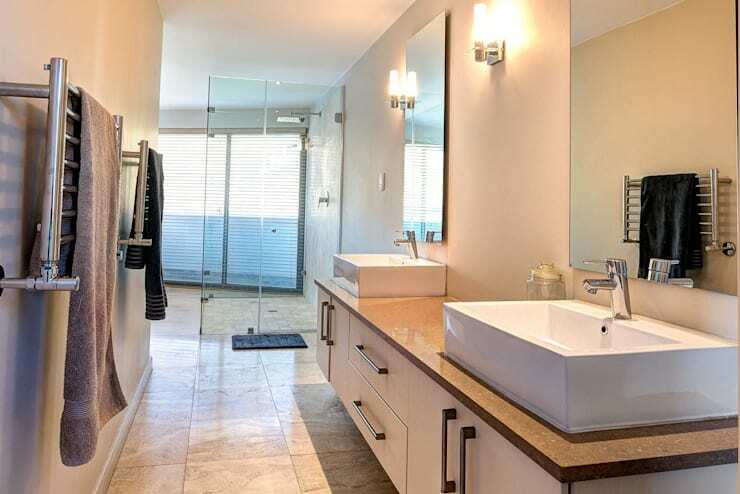 Bathrooms often get overlooked in home design but this should not be the case! If we think about how much time we spend in them, they should be one of the most important rooms in the house. Here we can see a very simple design with modern features and plenty of storage. The cupboards and cabinets allow personal items and make-up to be stored neatly out of sight, keeping the counter tops clean and tidy. No one wants a bathroom with personal items littering the sink area! We can once again see how much of a role natural light plays in a space like this, along with soft little lamps throughout, which create a beautiful ambiance and allow the family members to see what they are doing in the mirror. 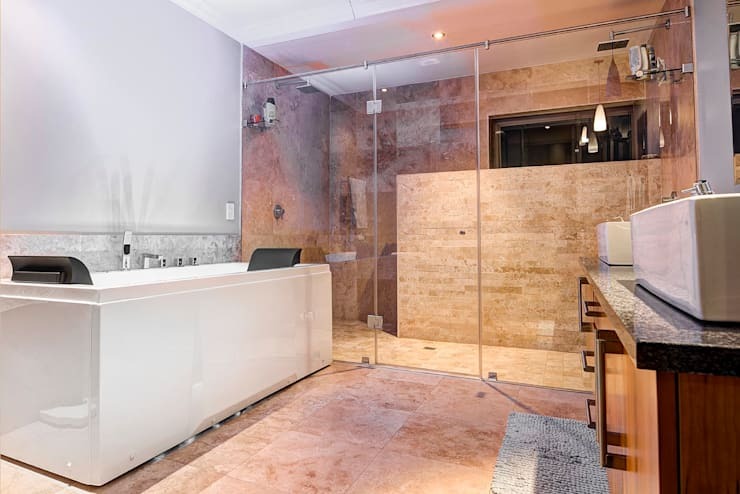 This bathroom is a great example of how modern, sleek and functional a bathroom design can be. Don't you love the glass shower, which is so big it almost looks like a sauna? There is also a very sophisticated bathtub, which allows for hours of relaxing in bubbles and unwinding after a long day. Have a look at these brilliant, beautiful bathroom trends for inspiration for your own home. 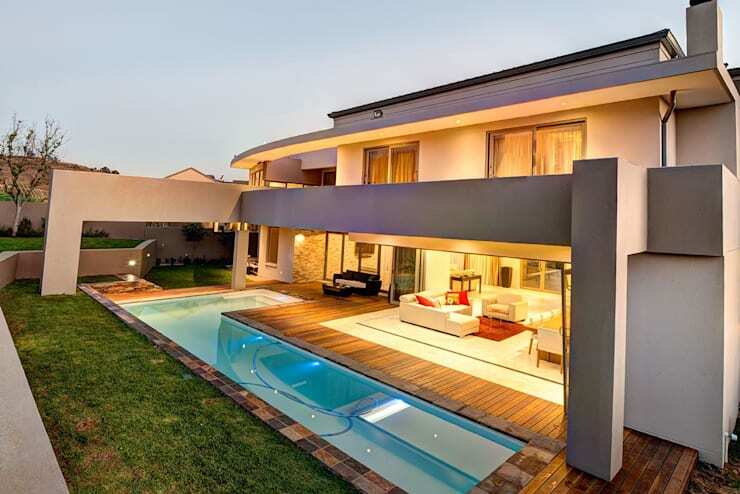 If you've enjoyed this home, you'll love these 5 pictures of sensational South African homes. 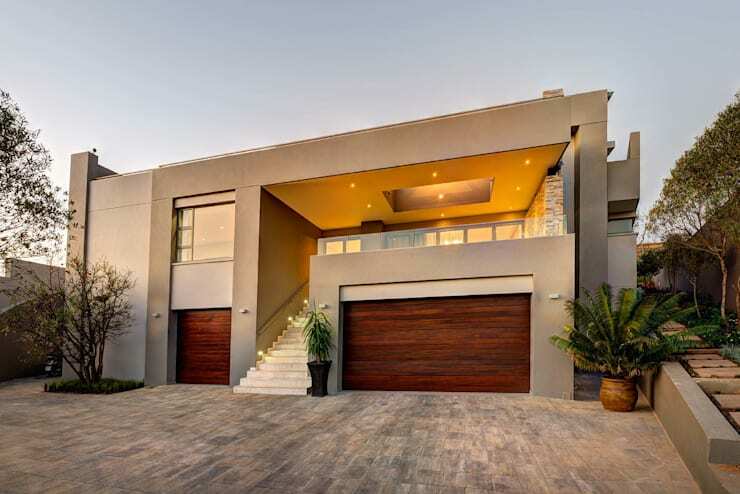 Are you impressed with this South African home?